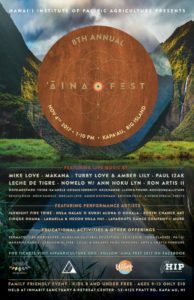 The 8th Annual ‘Āina Fest will held on Nov. 4, from 1 to 10 p.m., at Inhabit Sanctuary and Retreat Center in Kapa‘au. 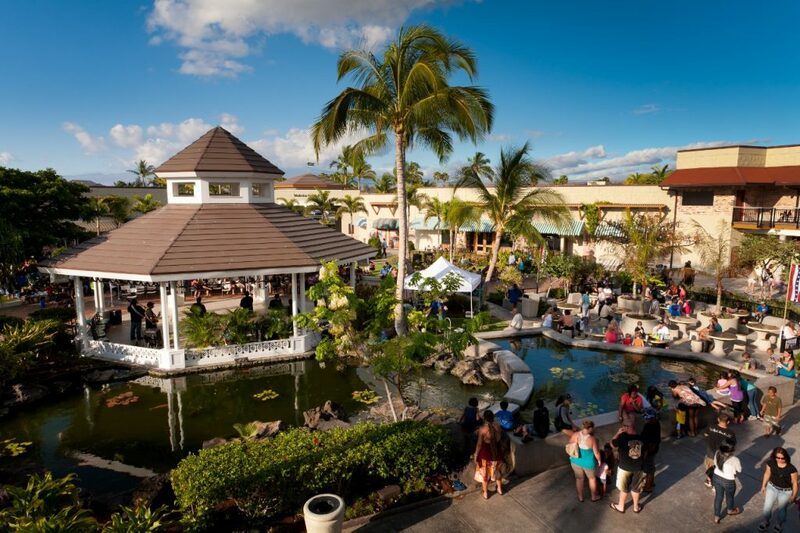 Presented by the Hawai’i Institute of Pacific Agriculture (HIP Ag), the festival will feature acclaimed musicians live in concert, educational workshops, Hawaiian cultural activities and more. 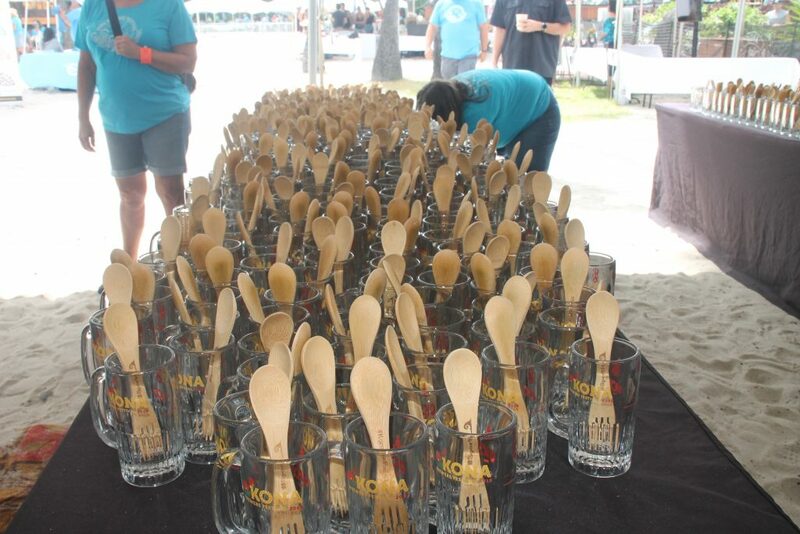 Food and drinks will be available for purchase from local organic food and beverage vendors. 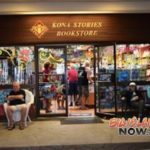 The lineup of musicians will include: Mike Love, Makana, Leche De Tigre, Nowelo featuring Ann Hoku Lyn and Reggie Griffin, Tubby Love and Amber Lily, Paul Izak, Hope Medford and more. 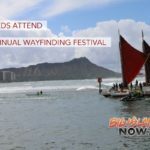 Hawaiian cultural activities will include a traditional blessing of the festival by Kumu Lanakila Mangauil, makahiki games, poi pounding, lei making, ceremonial fire and more. Festival tickets are $45 in advance and $55 at the gate, $10 for youth ages 9 to 13, and free for children aged 8 and under. 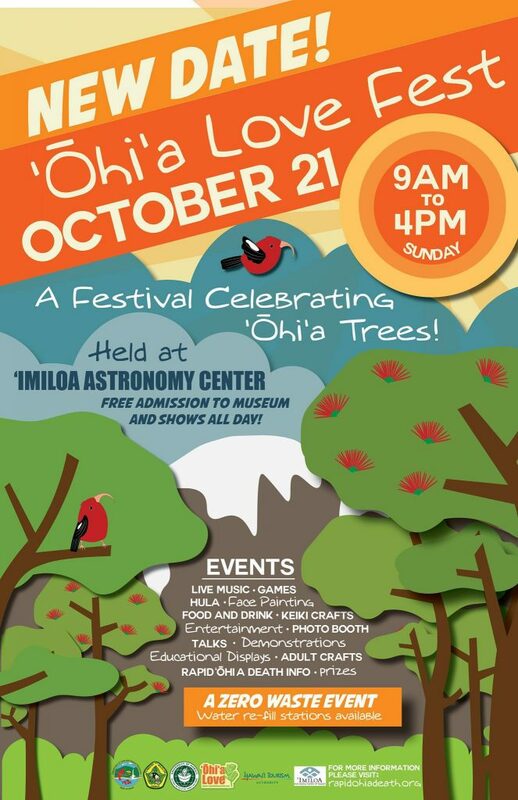 Tickets include all entertainment, keiki zone activities and educational workshops. For more information, or to purchase pre-sale tickets, visit hipagriculture.org/aina-fest/2017. Inhabit Sanctuary and Retreat Center is located at 53-4223 Pratt Road in Kapa‘au. Gates will open at 12:30 p.m. on the day of the event. 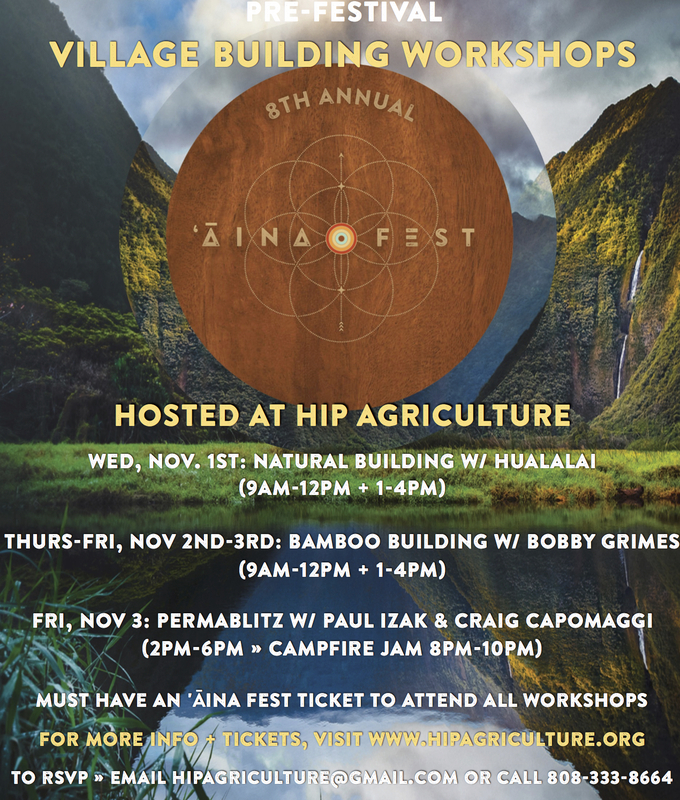 Leading up to the festival will be hands-on, land-based Village Building educational workshops from Nov. 1 to 3, including natural building and lashing with Hualalai, bamboo building with Bobby Grimes and permaculture planting with Paul Izak and Craig Capomaggi. Workshops are offered free of charge with purchase of a pre-sale ‘Āina Fest 2017 ticket. 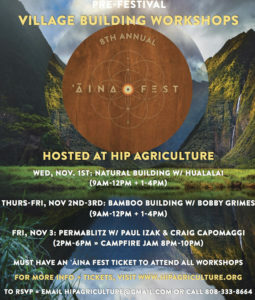 For more details and to register, visit hipagriculture.org/aina-fest/2017/pre-fest-workshops.